A, B, C, D, E, F, G and H are eight persons sitting around a rectangular table. Four of them sit middle side of table and facing away from the center and other four of them sit at the corner of table and they are facing towards the center of the table. They all have different age. The age of all the four persons who sit at the corner of table is multiple of 3 and the age of all four persons who sit at the middle of table is multiple of 2. E sits third to left of A. A faces outside. Two persons sit between E and the one whose age is 54. H sits second to right of one whose age is 54 year. Three persons sit between H and B ,whose age is 76 year. One of immediate neighbor of H is 69 year old person. C sits second to right of one whose age is 69 year. Only one person sits between C and F. The age of one who sits second to left of F is one year less than B. The age of one who is immediate neighbor of one whose age is 75 year is equal to difference between the age of B and A. D is not immediate neighbor of E. The age of one of them is 27year but he is not immediate neighbor of B. The age of H is perfect square and his age lies between the age of B and A. The age of D is 1 year less than age of H.
Q1. What is the age of D? Q2. Which one of the following sits immediate left of G? Q3. How many persons are there between A and D, when counted from left of A? Q4. Who sits opposite to A? Q5. The difference of age between F and C is? Q7.What is the code for ‘examination’ in the given code language? Q8.What is the code for ‘result’ in the given code language? Q9.What is the code for ‘bottle’ in the given code language? Q10.What is the code for ‘computer’ in the given code language? Directions (11-13): Each of the following questions consists of six statements followed by options consisting of three statements put together in a specific order. 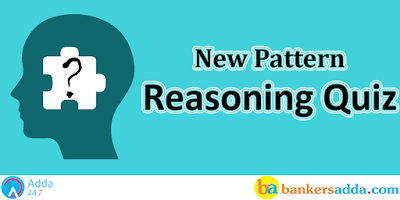 Choose the options that indicates a combination where the third statement can be logically deduced from the first two statements and that option will be your answer. i. All S are T.
ii. Some T are A.
iii. No A is P.
iv. Some P is R.
v. All R is X.
vi. Some X is P.
i. All R is X.
ii. Some X is P.
iii. No P is Q.
iv. No X is T.
v. Some Q is R.
vi. No R is T.
i. All A is R.
ii. All X is R.
iii. Some R is X.
iv. Some P is A.
v. Some X is A.
vi. Some P is Z. Directions (14-15): In the questions below are given some conclusions followed by five set of statements. You have to choose the correct set of statements that logically satisfies given conclusions either definitely or possibly. Assume the given statements to be true even if they seem to be at variance from commonly known facts. Q14. Conclusions: All dog is cat. No horse is boy. (a) All horse is rat. No rat is boy. Some boy is cat. All cat is dog. Some dog is elephant. (b) All rat is elephant. Some elephant is cat. Some cat is boy. All boy is dog. No dog is horse. (c) All dog is boy. All boy is cat. Some horse is elephant. All elephant is rat. No horse is cat. (d) Some rat is elephant. All elephant is boy. Some boy is horse. No horse is cat. All cat is dog. Q15. Conclusions: Some train is bus. No station is platform. (a) Some queen is train. No train is station. All bus is station. Some station is platform. All platform is road. (b) All queen is station. All platform is train. Some bus is train. All bus is road. No station is train. (c) Some queen is train. All train is road. No road is platform. Some platform is bus. No bus is station. (d) Some queen is train. No train is bus. No bus is road. Some road is station. All station is platform.